At Brookline Denture Center we are proud to offer premium quality custom dentures for less. We take great satisfaction in assisting our patients to achieve the quality of life and confidence they deserve. We offer same day emergency denture repair to help you get your day back on track. 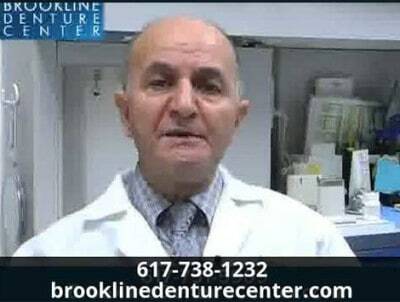 Brookline Denture Center brings custom, affordable denture services to patients in the greater Boston area. Our conservative treatment fees and in-house denture laboratory help keep the cost of your dentures as low as possible. You shouldn’t have to sacrifice the appearance and health of your smile. Our commitment to patients is to offer focused, quality care in this one area of dentistry so that we can provide impeccable yet affordable services that you deserve. We don’t believe that you should have to live with bad fitting dentures. If you’re interested in finding out more about our denture treatment options, we invite you to schedule a consultation with us at a time that is most convenient for you. During your visit we will discuss your expectations, concerns, and how our professional treatments can provide you with affordable, high-quality dentures in the least amount of time possible. Our beautiful new facility at 1842 Beacon Street in Brookline MA is conveniently located at the Englewood Ave T Stop and is wheel chair accessible from the front door.